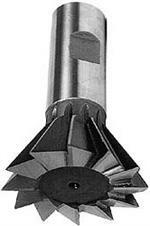 Toolinghouse is pleased to offer a large selection of Milling Cutters. If you do not see the cutter you are looking for please email us at sales@toolinghouse.com or call us at 239-314-4303. For slotting and light duty side milling. These cutters can be ganged or used as straddle mills. For milling male half circles. For milling female half circles. For light milling or finishing cuts. For heavy stock removal furnished with 45 degree left hand helix. Single Angle Cutters are utilized for milling ratchet teeth or dovetails. Double Angle Cutters are used for milling notches, grooves, serrations or threads. Double Angle Cutters are available in 45, 60 or 90 degree. Shank Type Concave Milling Cutter with weldon shank.To be used in manual or NC Machining Centers. For Milling Male Half Circles. Shank Type Convex Milling Cutter with Weldon Shank. To be used in manual or NC Machning Centers. For Milling Female Half Circles. Single Angle Milling Cutter for Chamfers and other angular milling operations. For Notches, V-Grooves and other angular milling operations. Arbor Type. Available in Right Hand or Left Hand Cutters. Specifically designed to mill radii on various materials. 1/2" diameter Straight Shank. Ideal for cutting standard and woodruff keyways in steel and other ferrous materials. Arbor Type. Staggered Tooth Woodruff Key Seat Cutters. High Speed Steel. Use for rounding corners and adapting many screw machine applications as end forming tools to form a specific radius. Dovetail Milling Cutters, Shank Type, High Speed Steel. Made in USA.